"Professional and always willing to go the extra mile. Highly recommended. The whole thing was great and the website was a real success. Thanks so much. I loved working with you guys - so little hassle!!!! Would happily work with you again - anytime." "Created exactly what we wanted and without aiming to a History conference website the envy of all those who visit it." Complete website solution, including initial consulting, web design concept, programming development, organisation and layout of content provided by client, as well as some unique content written, elements of SEO with meta tags and social media, and website hosting. 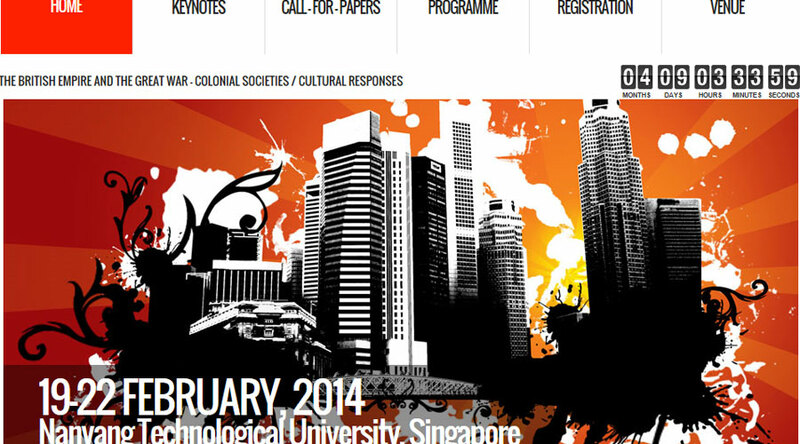 To mark the 100th anniversary of the outbreak of the Great War in July 1914, Nanyang Technological University is hosting the international conference The British Empire and The Great War - Colonial Societies / Cultural Responses o be held in Singapore, 19-22 February 2014, and invites speakers to participate with call-for-papers. The conference will include prominent keynote speakers from well known institutions around the world, as well as special guest musician. Focus for this project was to deliver a functional, professional and efficient website for promoting the conference and in turn encouraging participation and registration. Overall design was geared by the client, to portray an image of war (as per the conference topic), and to present content in a clear and concise manner - easy and quick to navigate. In addition to information about the conference, the site also has a page dedicated to Singapore travel, with embedded video from the official tourism organisation.